If you hike through the woods north of campus, you may just happen upon a fenced-in area tantalizingly marked “Keep out: UMASS AMHERST TAPHONOMY LAB.” A quick search on your smartphone reveals that taphonomy means “the study of decaying organisms over time,” only increasing the mystery. The mysterious zone is the field site for Associate Professor of Anthropology Ventura Pérez’s ’00G, ’06PhD six-week-long summer intensive course, “Field and Laboratory Methods." 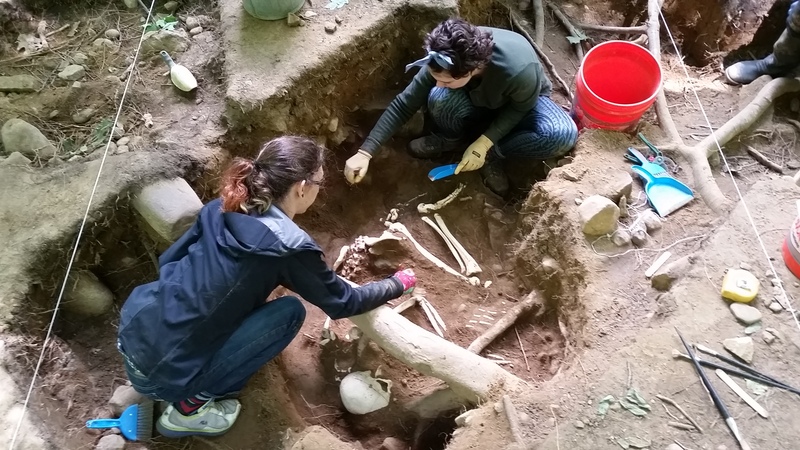 Pérez, a specialist in bio-archaeology and skeletal biology, conceived of the summer archaeological field school to focus on the excavation and analysis of human skeletal remains while he was a graduate student in anthropology in the College of Social and Behavioral Sciences. The taphonomy lab, home to a mock grave site and a mock crime scene, is fenced and clearly demarcated because in the early years of the lab, a hiker actually did stumble upon what he assumed to be hastily buried remains (the class uses model skeletons at the field site), and dutifully called the UMass Campus Police. Continue reading "Skull Duggery" on the UMass Amherst website. 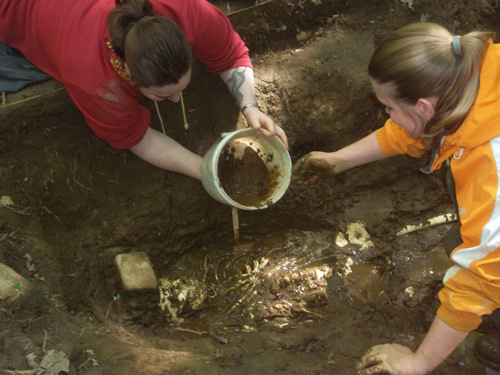 MassLive: "Students get muddy in UMass field class, where they learn to excavate and analyze bones"
Amherst - It’s another rainy day in a series of rainy days, yet the students are used to the mud and are focused on the bones that lie before them, not the weather. These are not real bones but tools to help them learn what to do when they are in the field with the real thing. The students have come from all across the country to learn about excavation and laboratory analysis of skeletal remains at the Taphonomy Research Laboratory at the University of Massachusetts. And mud or no mud, they are deep into it.